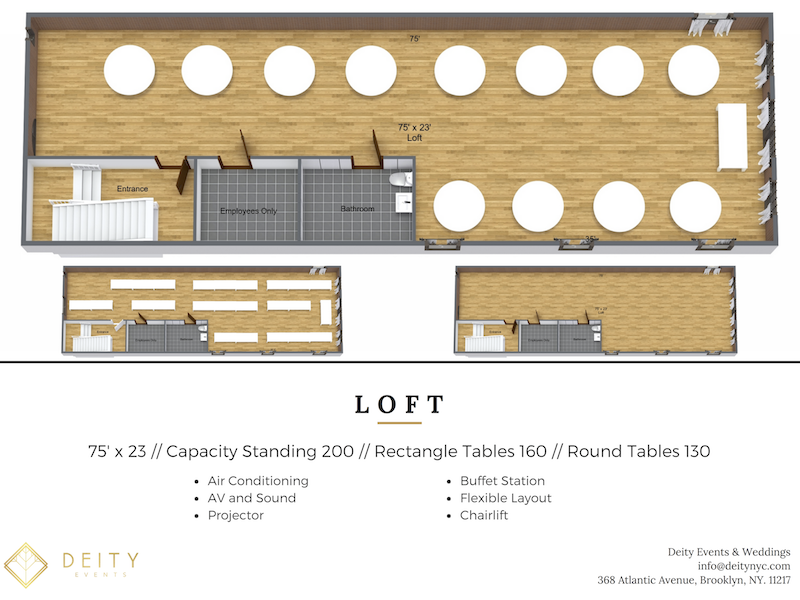 Deity Events in NYC has a unique layout and floor plan. The distinguished facade stands out on NYC landmark stretch of Atlantic Avenue. This Brooklyn building was refurbished with a unique floor plan to host the best parties or for your photo shoot. Each floor was carefully thought through to curate your nights event. 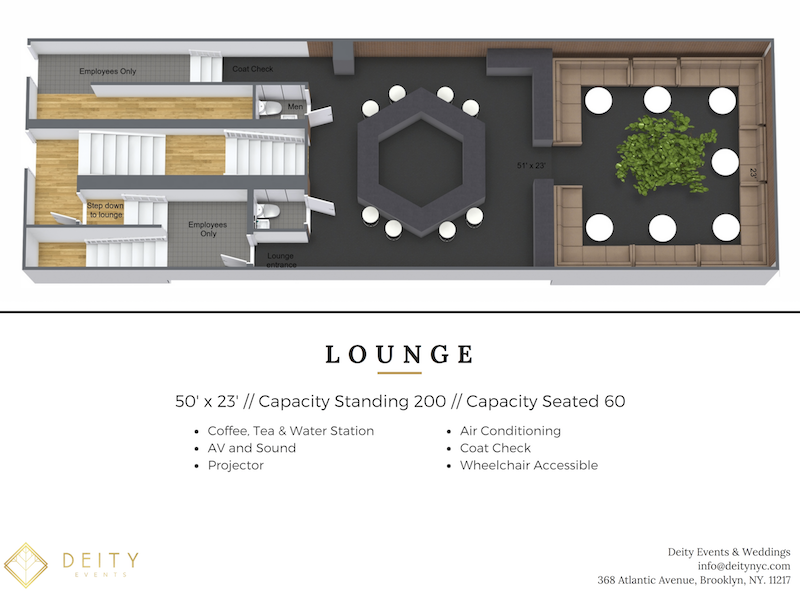 From the sound system, projectors, comfortable seating, and unique bar, everything is included when you come to our Brooklyn Venue. From lounging to dancing to elegant dinners we provide the atmosphere to make your guests never want to leave. Our Brooklyn Venue is ready to go with chairs, linens, table settings, accommodating staff, one of a kind decor and delicious in-house Brooklyn catering. Finding a DJ is one less thing you have to search for. The Deity DJ has worked with dozens of the worlds biggest super stars and he is fantastic addition to the night. Don’t let all this space fool you, you don’t have to chose one space for your event or filming. 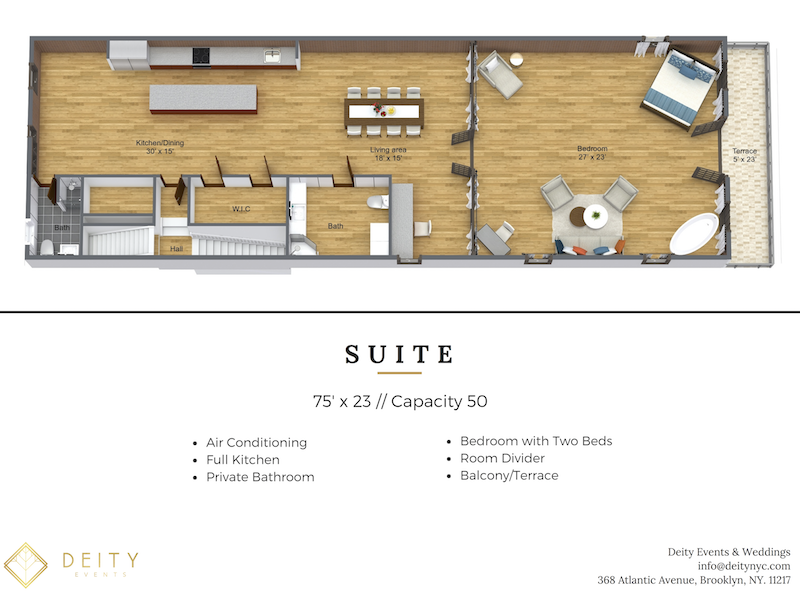 Each floor has a purpose and are available to use for your purposes. Lounge space in Brooklyn features a hand poured hexagon bar perfect for entertaining your guests. A Tree of Life dominates the the sunken lounge area with velvet banquette seating. Accented by custom stained glass windows, chandeliers, and candlelight. In-house Brooklyn catering brings it all together to enjoy a welcoming cocktail hour or standing dinner party. Our staff will pass hors d’oeuvres for an elevated experience for your guests. The Lounge has two drop down projectors, so you can display branding or presentations. The Deity Cellar is equipped and ready for your choice of entertainment. Our Deity DJ is available for your event for a $600 charge. Let Deity serve from our menu or your choice of dessert in the cellar to fuel your dance party. Deity has a number of preferred vendors curated from local shops in Brooklyn, NY. Deity’s servers will cocktail your favorite drinks from the Deity bar to you on the dance floor. The Loft is open and airy with large windows and string lights. This is our largest room to host intimate seated dinners up to 150 people. The Deity Loft also has a pull down screen and a projector to have a presentation during the seated meal. Deity’s professional staff can serve your seated meal here. Guests can be seated at 60 inch round tables in the Loft for dinners up to 135 guests. Long, tuscan-style dinner table set-up is provided for guests counts of 135-150. For photoshoots, filming or special events sometimes there is an alternative flow to the evening that must include a beautiful view. 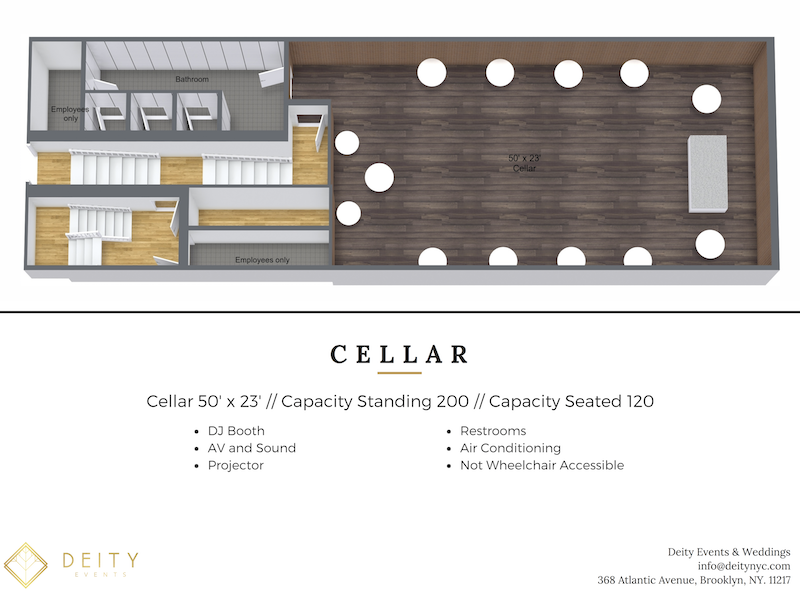 If you have a large presentation, luncheon or corporate event, but need a separate break out space, you can use this exclusive space at an additional charge. With sweeping views of Downtown Brooklyn, we cannot think of a more epic setting for your photo shoot or filming project. This Brooklyn rooftop is complete with an oversized, in-ground jacuzzi and lounge seating. It is also available for small events, at the discretion of the owner and for additional rental fees. 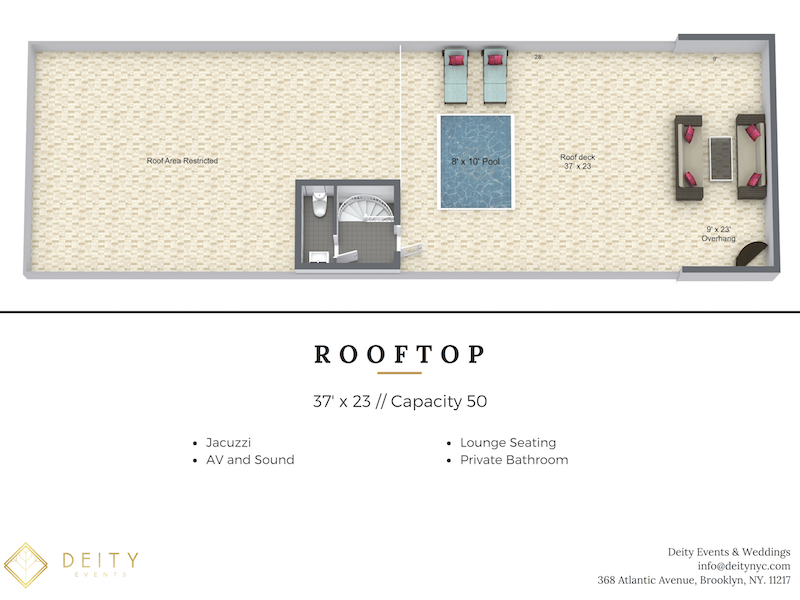 Please note that the rooftop is private and is only accessible by a steep, spiral staircase. Web Design by Design Burd Inc.